We haven’t introduced a new vegetable in a while, so today, we wanted to invite you to try some Jicama. It is readily available and it excellent raw or cooked. Jicama is the edible starchy, tuberous root of a South American vine of the morning glory family, and is sometimes called a Mexican potato or yambean. It is similar in nutrition to the sweet potato with good con-centrations of vitamin C and potassium, low in sodium, and has fewer calories and carbohydrates that the sweet potato. It’s a good source of fiber. Remember arrowroot? Arrowroot is a common cooking thickening agent – and is made from jicama. 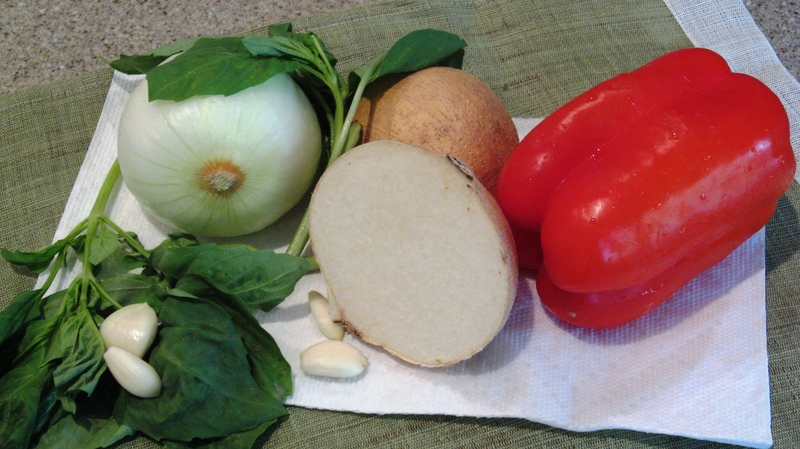 Jicama is 85% water and is a great substitute for water chestnuts. 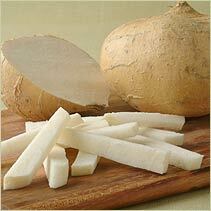 Jicama resembles a turnip or a large radish, and it can be used as an alternative to the water chestnut as mentioned. Its skin is quite thin and can be gray, tan, or brown in color. Look for nice light tan Jicama with minimal spots. It has a short root and has pretty white flesh. If you decide to eat it raw, peel it with a vegetable peeler and enjoy it. It has a sweet subtle taste much like an apple or pear. It does not discolor when you expose it to air like some other vegetables or cook it and it takes on flavors beautifully. Jicama is a great snack alternative, is excellent in salads, side dish, stir-fry or Thai dishes. What would you do with these ingredients? and which protein would you pair with these ingredients? Jicama is a relative of the potato family. It is the cousin of the sweet potato. Jicama is a name derived from Nahuatl xicama or xicamatl, a name the Aztecs gave to several varieties of edible roots. It is a popular dietary staple in Latin America and widely grown in Mexico and Central America. Native Americans used the crushed seeds of the Jicama plant as a fish poison. The crushed seeds were cast over the surface of a lake or river, the stunned fish would rise to the surface and were easily caught. The fish poison produced in the seed is the insecticide rotenone. Amazing stuff! I like to eat it the traditional way, which is cut into matchstick-sized pieces and sprinkled with lime juice and chili powder. Jicama treated this way tastes great atop a Mexican-themed salad. I also saw a recipe recently where it was included in a fruit salad with grapes, strawberries, and kiwis. I’ll be it blends right in and absorbs the juices of the other fruits and adds a great crunch. Yum! I sometimes shred it in my coleslaws. Good to know, interesting choice for dog food though.